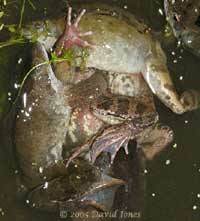 6 March - Like me, the frogs are finding it hard to get going. Since the great gathering started (and stopped) a couple of weeks ago, the temperatures have remained within a few degree of freezing. 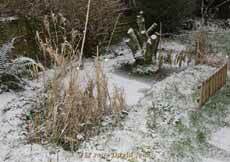 This picture shows the big pond on the morning of the 4th when we had the first 'good' fall of snow. Under the white blanket, the ice covering was only thin and by the end of the morning both snow and ice had completely disappeared. Yesterday it started with an ice covering, but the birds were bathing by 11am. 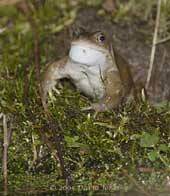 I checked the pond for activity during the day and saw no frogs at all, and at 10pm I managed to spot just two. Today has been bright and sunny. 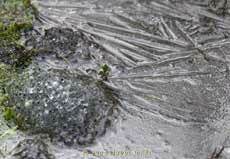 The pond was once again frozen over this morning, and there are still traces of the ice there this afternoon. Another hard frost is forecast for tonight. While there appears to be no activity in the pond, I nearly tripped over this pair just after lunch. The presence of duckweed on them is evidence that they are residents - perhaps they decided that with the water so cold they needed to warm up their relationship in the sunshine. The cold weather seems to have gone for the moment, although the forecasters are suggesting it may return at the end of the week. 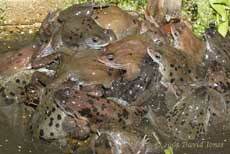 During the morning the mass of frogs reappeared. Unfortunately, there was no opportunity to count them or take any photographs as they all dived in a mass of splashes as soon as I started to approach the big pond. I had another look after dark (around 7.30pm) but the pond remained very quiet. 10 March - The weather is distinctly milder today. It was cloudy all morning, but when the sun broke through in the afternoon the temperature in the garden topped 12C. The frogs' level of activity has increased a lot in the last two days, but they are still very sensitive to movement near the pond. There were a couple of 'huddles' going on, although most of the time they were hidden underwater. 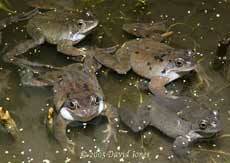 This group appeared several times, with frogs joining or leaving the group as it rolled about. It's possible that we shall see the start of spawning in the next day or two, as long as the temperature doesn't drop too much on the weekend. It is now five days later than last year (ignoring the false start that took place on the 29 Feb 2004). 11 March - A mainly cloudy day, with some sunny periods taking the temperature almost up to 10C, and it was quite breezy. 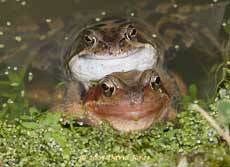 The big pond was a noisy place today, with more than 80 frogs active all day - but no spawn as yet. 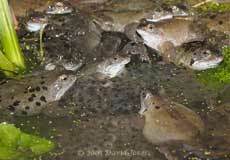 Most of their time was spent gazing out towards the sides of the pond, emitting the occasional croak (lower-left frog). 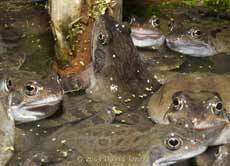 It's as though they are all waiting for some signal that will trigger spawning to start. 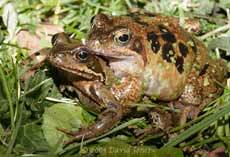 During the first half of the day, pairings were short lived, and often a result of one frog making a sudden movement and being pounced on by another. As the day progressed, there were more longer lasting pairings to be seen, but most of these attracted little attention for the other frogs. I only saw one 'serious' huddle take place by the end of the afternoon. 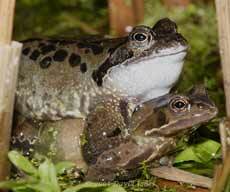 This one showed all the signs of amplexus, with the female being held firmly in the grip of several competing males. 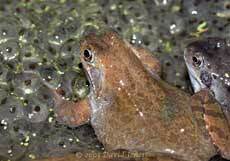 In the picture, I believe the female is the frog with a reddish complexion - that's one of her front feet stick up at the top of the image. 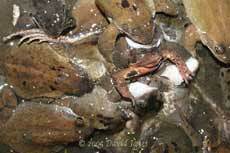 The main group of four frogs was continuously rolling over and being visited by others. The pond was a noisy place this morning with many of the frogs down the shallow end and the first spawn having appeared some time before 8am. It was a cold start to the day and the temperature at that time was only around 3C, gradually creeping up to 7C by the afternoon. On a mainly cloudy day what looked chaos continued through the morning, with occasional pauses, and the appearance of another clump of spawn. By late afternoon the pond had become very quiet. Many of the frogs had disappeared under the surface and there was only half hearted activity by those remaining in sight. 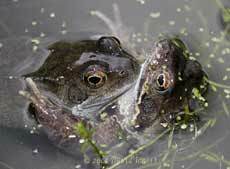 13 March - A frosty start meant that there were few frogs in sight when I checked the pond at 8.30 am. 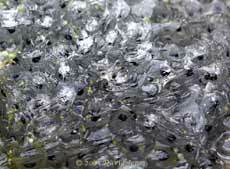 A thin veneer of ice covered only the shallow areas where the spawn is being deposited. The only spawn that seemed to be affected was the lump laid half out of the water. In this image you can just see the crystalline formations of the ice. The eggs themselves are well protected by the gelatinous sphere. By 11am the ice had completely disappeared and the frogs were back in action. 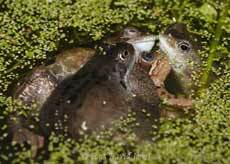 with moments when a frog had time to pause before heading off to join in another scrum! By noon the pond was quiet again, with just a small number of frogs in sight and only a few more lumps of spawn as a result of the morning's efforts. I must include a photograph taken yesterday, and somehow left out of the diary entry. 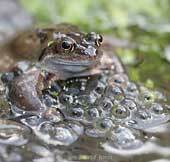 While so many frogs were dashing about, climbing over each other, and diving into the spawn as they desperately searched for a prospective mate, there, in the midst of chaos this frog had decided on its 'perfect partner', one that didn't want to dash off elsewhere. It spent ages hugging the base of an old Reed Mace plant, hanging on tightly even when others were bumping past it, and you can see how the rotten outer layers of the plant have been rubbed away. After a few quiet hours, and coinciding with Wales beating Scotland at rugby (:-), another big scrum started up in the pond. I leave it to you to count the frogs in this one. They are all males in this shot, wresting to get closer to the female that is buried somewhere under the writhing mass. It was some three quarters of an hour later when I actually caught sight of the centre of interest. 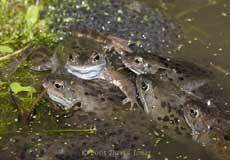 She is the reddish frog right of centre in this shot. Moments later she had disappeared again, and the scrum is still continuing an hour later. Is there a shortage of females? 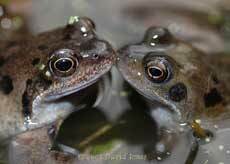 In the deep part of the pond there is a group of just three frogs engaged in much quieter embrace, not attracting the attention of any others at the moment. 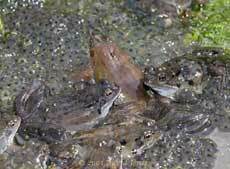 14 March - Spawning is still going only slowly, and there was very little extra spawn produced today. I only saw one serious scramble all day, although there were numerous pairs to be seen around the pond. For most of the frogs it was a case of dashing about, trying to find where the action seemed to be, and not being sure which way to go next! Finally, out of the chaos, a final picture that provides a chance, but misleading image of a gentleness that is just not part of the mating rituals of the frogs. 15 March - As the temperature rises slowly (11C at 3.30pm) there is still an air of 'waiting for something to happen' in the pond. There are a lot of frogs around the sides, and more out of the water today. 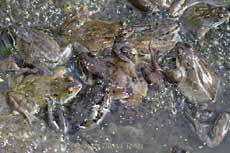 There is a lot of croaking, but only a bit more spawn, and just one group of frogs that appeared to be around a female, although even that group lacked the enthusiasm I expect to see at such times. 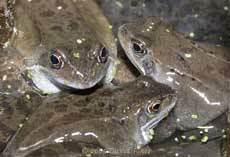 At 5.45pm there is just one ball of four frogs rolling about in the deep water. However, despite the apparent lack of activity I have just counted at least 106 frogs in sight in or around the two ponds, so it's clear that they are still arriving. I nearly trod on one on our veranda.